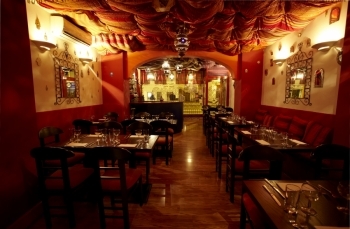 Azou offers the very best in Moroccan, Algerian & Tunisian cuisine, which will appeal to all the senses. our menu reflects the huge variety of dishes from North Africa. Winner of Hammersmith & Fulham's Best Food Business and The People's Choice awards, and awarded Michelin Bib Gourmand. At Azou you will be welcomed and served by friendly and efficient staff, in an atmosphere that is comfortable and relaxed. A mixture of traditional low rise and conventional seating, North African crafts and drapes, give Azou a traditional feel, while the fragrant aromas, dusky lighting and North African music create at atmospheric dining environment away from the hustle and bustle of daily life.